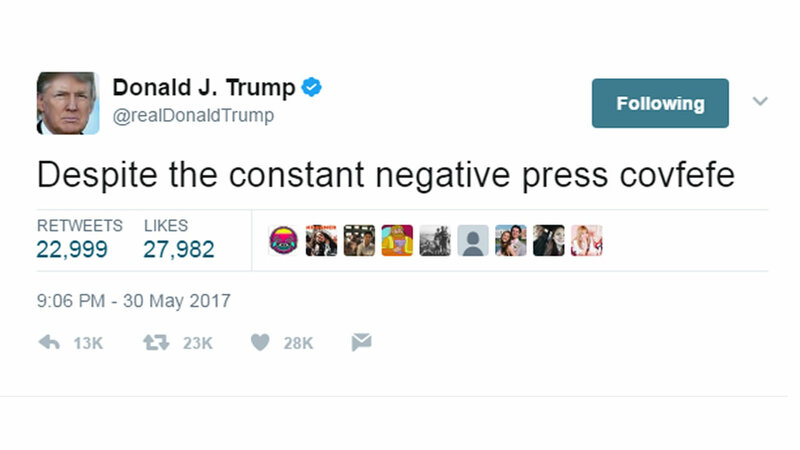 WASHINGTON (KGO) -- The internet quickly went into a frenzy Tuesday night after President Donald Trump sent out a midnight tweet talking about "negative press covfefe." The apparent typo, which remained on his account for more than an hour, sparked thousands of humorous and confused responses on Twitter. In less than an hour #covfefe was the top trending term, as the statement was being retweeted, liked, and commented on tens of thousands of times. Many Twitter users took to the social media platform to try and understand and speculate what the President could have meant. Regardless, many believed the tweet would have been deleted -- but it was left up -- magnified to Trump's 39 million plus followers.